If you thought the controversy surrounding Fallout 76 ended at the game itself, you’re in for a surprise. 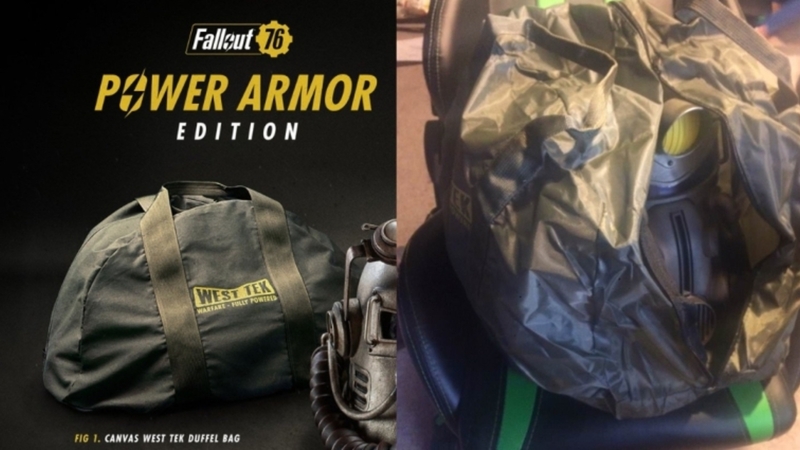 Bethesda is now in trouble with fans for promising a canvas duffel bag in its $200 (£156) Power Armour Edition of the game – and instead delivering a cheap nylon replacement. Now, in an attempt to placate fans, Bethesda has apologised and promised to give affected customers 500 Atoms (Fallout 76’s in-game currency) as compensation. The foundations for bag-gate began last week when recipients of the Power Armour Edition noticed something was amiss in their deluxe package. Customers began to post comparisons of the promotional material for the edition and what was actually delivered, and claimed Bethesda had changed the bag’s description on the site after they began submitting complaints. Sure enough, the official Bethesda Store now says the bag is made of nylon, but the image still reads “canvas,” as does the Amazon listing for the product. Bethesda has since confirmed this email is real, but insisted the response was “incorrect,”. The company switched to a nylon carrying case “due to unavailability of materials”, Bethesda said. As for the customer service staff member behind the curt reply above, Bethesda said they’re “a temporary contract employee and not directly employed by Bethesda or Bethesda Game Studios”. Unfortunately, due to unavailability of materials, we had to switch to a nylon carrying case in the Fallout 76: Power Armor Edition. We hope this doesnâ€™t prevent anyone from enjoying what we feel is one of our best collectorâ€™s editions. In an attempt to resolve the situation, Bethesda is now offering affected customers 500 Atoms as compensation, and has set up a support page for those who bought the Power Armour Edition. In real-world money, a pack of 500 Atoms can be bought for £3.99 – but as many have highlighted on social media, this (ironically) isn’t enough to buy the in-game version of the outfit that comes with the canvas bag, which costs 700 Atoms. Whether you get cloth or plastic when you scrap it is still unconfirmed. Although Bethesda has finally come clean, it’s still unclear whether this gesture will be enough to calm fans who dropped several hundred dollars on what was supposed to be a deluxe version of the game. Speaking to LanternCupcake – one of the customers who posted a support message screenshot – it sounds like this won’t be the case. Online too, the reaction to Bethesda’s actions remains overwhelmingly negative. As Reddit user SenorBeef highlights, giving away virtual currency does not have direct costs for Bethesda. “Why not give people $50 or even $100 worth? $5 of a real refund would feel insulting, let alone $5 in virtual currency,” they added. Seems like the only thing Bethesda has bagged themselves is further PR woes. Judging by the reaction so far, bag-gate may rumble on for some time to come.